Liverpool’s injury crisis grows even more after the match against Tottenham Hotspurs last Sunday as they lose another important player, Jamie Carragher, who was forced to be replaced in the second half of that game. 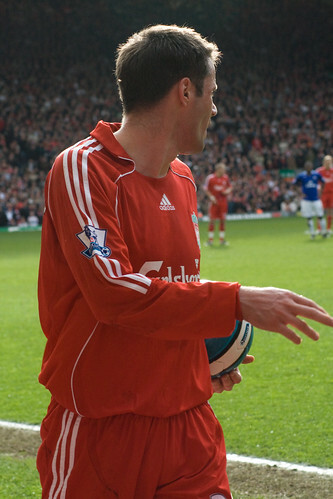 The latest reports suggested that the Pool fans should definitely be worried about their team’s defense in the next couple of weeks as Carragher could be out for quite a while after being diagnosed of dislocating his shoulder. The bad news was revealed by the Pool’s coach himself, Roy Hodgson, who was very disappointed with Carragher’s current injury and although he can’t confirmed how long would the veteran defender will be out, the tactician believes that it should take a while. The coach also bemoans the fact that the injury happened in a very bad timing as they are still missing Daniel Agger at the back and mostly having already lost a leader in Steven Gerrard, loosing Carra is a big blow for the former Fulham coach. The concern of Hodgson is surely understandable considering the importance of Carragher’s seniority for the other players in the squad, losing him for a long time without having quality subs would jeopardize Liverpool’s campaign of getting back to the top spot. Not to mention the absences of Gerrard , who is also the main leader on the team would mean the Pool will play their next few games without inspiring players on the pitch. Moreover, the signs of the trouble that Liverpool might have without the availability of inspirational player at the back like Carragher already occurred when he was forced to leave the pitch in the second half. The re-organization that the Pool needed to do after Carra’s injury was one of the key element that Hodgson believed cost them the match against Spurs last Sunday.